Oh, hey, Blogger! Nice to see you! It's Fabulous Friday over at Between the Lines, and I thought I'd link up and tell you all what is fabulous about today. - I have more and more freelance work coming in and the energy to do it. - I've gotten most of my writing done today so the babies and I can go swimming this afternoon. - My kids wake up singing me songs. - It's a beautiful hot Florida day. 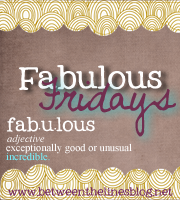 What's fabulous in your life right now? If you enjoy this blog, please vote for Tales of an Unlikely Mother on Babble.com. We're number 14 (one vote away from 13! ), just scroll down and click on the thumbs up! Swimming sounds nice! I miss it! Working FT with no pool and limited beach access is hard during the warmer months. My kiddos could have played in the sprinklers all day if I would have let them.